Throughout the year, Siddha Yogis and new seekers have been practicing Gurumayi’s Message and making it their own in many ways: as part of their meditation practice, before falling asleep, upon arising, while walking, when faced with an important decision, when pausing in the midst of activity, when they are spending time with their families, and countless more. On this page, you have the opportunity to reflect on and share your own unique experiences of practicing Gurumayi’s Message and making it your own and you can be inspired by other’s experiences of doing the same. 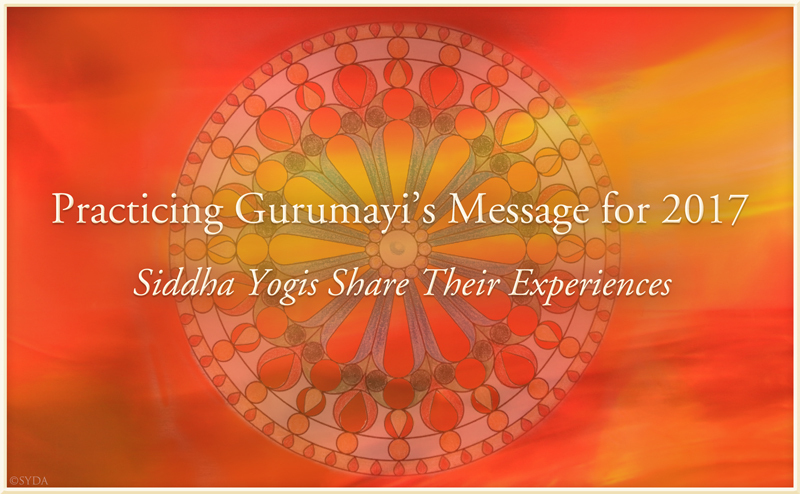 What does it mean to you to make Gurumayi’s Message your own? In what ways and at what times have you been practicing Gurumayi’s Message? How have you benefitted from practicing Gurumayi’s Message and making it your own? Set aside some time to reflect on the questions that resonate for you, and make notes in your journal. Once you have written down your experiences, click the link below to share them here on the Siddha Yoga path website. And, visit this page often to read about and receive inspiration from the experiences of others. I have been practicing Gurumayi's Message for 2017 since I received it on January 1. I have done this by repeating it to myself whenever I remembered it during the day or night, and I combined it with my breath. In the beginning it seemed difficult to me. But since I didn't know how to change that, I just continued my practice. When we came closer to the end of the year, I noticed that something had changed all by itself. Instead of my trying to do something, the breathing was happening by itself. I also noticed that I was able to let go not only of my attempt to control my breathing, but also of my attempt to control everything about life. It now seems to me that I have become more relaxed and tranquil. And now I can feel the joy of breathing. This is the work of grace! Throughout this past year, every day I have tried to take time to focus on my breath and reflect upon Gurumayi’s Message for 2017. Wherever I am, whatever I am doing, connecting with my breath immediately makes me calmer and reminds me of how blessed I am. I remember feeling very stressed one Sunday night as I was trying to start a history paper due the next morning. Realizing that I was unable to come up with a good topic, I decided to take five minutes to turn off my computer, close my eyes, and repeat Gurumayi’s Message. I immediately felt at peace, my concerns disappeared, and I finished my paper with a renewed sense of vigor and concentration. The Message has given me the opportunity to connect with my inner Self and immerse myself in the rhythm of my own breath, anytime during the day. Today, while meditating on Gurumayi’s Message for 2017, I had the realization that practicing and imbibing the Message throughout this year has created a beautiful state of balance within me and in my life. With every conscious inhalation, I feel Gurumayi’s grace and blessings. And as I become immersed in the light in my heart, I am able to give blessings back to my world just as spontaneously as I breathe out. This practice has created for me a great circle of love and blessings. Thank you, dearest Gurumayi, with all my heart. For me, Gurumayi’s Message for 2017 is both a command and a blessing, so direct and practical that I have been hard-pressed to find a time when I am not receiving its benefits! When I focus on the breath periodically throughout the day and enjoy its rhythm and sweetness, I find I’m naturally drawn to both the peace and the longing I find in my heart. Gurumayi’s Message has brought me a true friend, my own breath. Engaging with Gurumayi’s Message for 2017 has transformed my life experience on many levels. As I’ve practiced the third line of Gurumayi’s Message, I’ve experienced compassion both for myself and for all that my breath touches—people, objects, activities, concerns, and even old memories. This practice has also released my mind from many habitual worries. It has truly been a gift of grace. The day I received Gurumayi’s Message for 2017, I was filled with enthusiasm and I made a commitment to practice the Message. I started repeating the Message when I got up in the morning, during meditation, while walking to my office, while observing nature, and, throughout the day, in my interactions with people. I have noticed that my way of handling situations has gradually taken a positive shift. I now feel more peaceful and calm. Thank you, Gurumayi, for this grace-filled year. Gurumayi's Message for 2017 is the foundation for my meditation practice each morning. Over the past year, repeating the words of the Message with each in-breath, pause, and out-breath has deepened my meditation significantly. I'm especially grateful for the space of stillness I experience between the breaths. I carry the awareness of my breath into my day. Thank you, Gurumayi, for your teachings that support me in going deeper in my sadhana. As I began to practice Gurumayi’s Message for 2017, I realized that my mind wanted to understand every sentence. So, I decided to surrender with love and devotion to the Message—free from any expectations, just trusting that it was a process and that I would assimilate the Message as I allowed it to unfold within. So, I have been practicing the Message in many ways: repeating it aloud and to myself; during the day and when going to sleep; in solitude and with family; and in meditation as a dharana. Thus, little by little, all inner obstacles were dissolved, I understood the importance of breathing with awareness, and was able to make the Message mine. I now feel that Gurumayi’s Message has settled in my heart and is guiding me towards my innermost Being and to the source of all creation. After receiving the precious gift of Gurumayi ji’s Message on January 1, 2017, I began to reflect on how to make it my own. I found several practical ways to imbibe the Message and implement it in my day-to-day life. I started to write the Message in my journal before I recite Shri Guru Gita every morning, and I meditate by focusing on my breath. As a result, I now have a deeper and more peaceful meditation experience. I also observe the flow of my breath when I get up in the morning and before I go to sleep at night. And throughout the day, I focus on my breath to quiet my mind and go beyond disturbing thoughts. As I have made Gurumayi’s gift my own, my communication with others has improved, my listening skills have been refined, and my Siddha Yoga studentship and seva practice have bloomed as well. Thank you, Gurumayi, for your golden gift. I feel your grace flowing through my breath. In the past year, I’ve often repeated Gurumayi’s Message for 2017 as I entered meditation. What a blessing it’s been to allow Gurumayi’s words to draw my awareness inside to the light of the Self. And what a blessing to offer the goodness of the Self with every exhalation. The Message has made each breath seem infinitely precious. Recently, I was serving at the welcome desk of our local community center for senior citizens. I realized how deeply the Message had entered me when I found myself feeling blissful love for everyone I spoke with. Thank you, Gurumayi, for this unfailing pathway to the Self and to offering loving-kindness to the world. Among the many techniques I have learned on the Siddha Yoga path to connect inwardly to the Self, focusing on the breath is my favorite. Each time I sit for meditation and focus on my breath, it draws me easefully inward. When I received Gurumayi's Message for 2017, I was overwhelmed with joy as it was on the breath. I set up a schedule of daily meditation and I started repeating the Message like a mantra in meditation. I discovered that each sentence of the Message gives me step-by-step guidance on focusing my attention inward. In the process of focusing on each sentence, I was also listening to the sound of the incoming breath and outgoing breath, and becoming completely still during the pauses between the breaths. These daily meditation sessions have made me calmer, more centered, and more focused in my daily activities. Thank you, Gurumayi, for this profound gift of knowledge! Gurumayi’s grace has supported me with astonishing blessings throughout a demanding year. Recently, when I received a call about challenges my mother was facing, my husband reminded me to pray to Gurumayi for help in maintaining my stance as an observer. Suddenly, Gurumayi’s voice surged from within and I heard her repeat every sentence of her Message for 2017. Such a peaceful feeling embraced me. This connection with grace gave me a sense of expansive awareness and recognition. I found that I was able to breathe out divine kindness to myself, to my mom, to the particular situation, and to all my life circumstances. I am grateful for the gift of sadhana, as it helps me become aware that whenever I reach out for the Guru's grace, it is already there waiting to comfort and guide me. As soon as Gurumayi ji gave her Message for 2017, I began to make it my own as a most precious gift of my Guru. In the first few months, I repeated it as a mantra. Then slowly, through meditation and reflection, Gurumayi's Message became my steady companion. In my daily life it gave me such clear understanding: sometimes for completing some task, sometimes for behaving in a particular manner with my family, and sometimes for understanding another teaching. And now, at the end of the year, I see that the most precious benefit I have received from practicing Gurumayi's Message is that I love myself and others so naturally without any effort. I am so thankful to Gurumayi for giving me this state of life. Thank you, Gurumayi, from the core of my heart for your kindness and compassion, and for guiding me in so many ways to understand your Message. As I connect to Gurumayi’s Message for 2017 with my breath during meditation or especially when I’m out in nature, I feel such gratitude for both the Message and the power of my breath. My breath connects the inner and outer worlds, and makes me feel vitally alive and present. Thank you, Gurumayi, for this experience of oneness with the Heart. Recently, each time I recognize a new insight, Gurumayi's Message for 2017 comes to mind. In such moments, I can clearly connect what I am learning with one or more lines of the Message. From contemplating the word fragrance in the first line, I have learned to keep my heart fresh and free from constricting emotions and negative thoughts. I have learned that I have the power to master my own perceptions and emotions. From contemplating the third line, I see that when I kindly extend my uplifted understanding to myself and others, this can produce long-lasting, loving, and peaceful relationships. I am deeply grateful to Gurumayi and the Siddha Yoga path for these insights—and for so much more! I have been making a consistent effort to make Gurumayi’s Message my own. I do this in part by studying other teachings given on the Siddha Yoga path website—in the meditation sessions and elsewhere—to expand my experience of the Message itself. I am finding that I am able to remain more centered in many situations—both difficult and happy ones. I feel something within giving me the courage and humility to speak up more and offer what is right for the situation at hand. In the face of challenges, I am grateful to be able to pick myself up and move forward. Thank you, Gurumayi ji, for your Message and for the way it is bringing me a sense of increased ease and enjoyment! I come back to the Message again and again as I go through my day. I become aware of my breath — and in that moment I know that Gurumayi ji is present with me in the form of my own breath. While in the past I wasn’t even aware that I was breathing, now breathing is a joy! Contemplating what the Message means to me, I realize that it is about my life, about keeping the company of my own breath −− my companion forever. It teaches me how to truly breathe because the breath is God's gift to me. It teaches me that this very breath is the living divinity I carry with me all the time. Through the breath I experience that I am alive in the truest sense. Gurumayi ji, thank you for your grace, your blessings, and your life-transforming teachings. Remembering Gurumayi’s Message for 2017 when I wake up in the morning transforms my experience of entering the day. When I remember to breathe in fully, connecting with the Heart within and around me, I experience myself being filled with light. This light seems to wash away all concerns and contractions, and I become absorbed in the awareness of that light within as being my essential nature. When this happens, I feel I can breathe out healing light and blessings into the world. What an amazing gift this is! I am grateful for this beautiful practice. The way I practice Gurumayi's Message for 2017 is by repeating it a number of times as I go into meditation every day. At times, I experience the Message as the voice of my inner Self, resounding powerfully within. Day by day, I experience transformation occurring. Virtues such as humility, worthiness, and compassion have been revealed within me, as the Message has continued to purify my heart. Thank you, Gurumayi, for this beautiful and deeply transformative Message. While journaling about the question, "How have you benefited from practicing Gurumayi’s Message and making it your own?" I realized that I have become more aware of my physical, mental, and spiritual well-being. My relationships feel stronger and more spontaneous. I feel I am able to listen and respond with greater love and confidence. I have focused on allowing grace to be the doer, and this is helping me develop a calmer attitude toward my daily life. I had always thought of the Heart—both my own heart and the universal Heart—as residing within my body. Recently, as I was reflecting on Gurumayi’s Message, I experienced that my inhalation, the pause before the exhalation, and my exhalation were all taking place within the one universal Heart. Thank you, Gurumayi ji, for bestowing this experience: for showing me that there is only one heart—God’s Heart—in which we live. Today, as I began my morning meditation by repeating aloud Gurumayi’s Message for 2017, a surprising thought arose: “Imagine how it feels to experience unconditional love for everyone.” My mind immediately flew to some people with whom I have had challenging relationships, and I saw them in a new light. With no effort on my part, I felt unconditional love towards them. I now understand what the first sentence of Gurumayi’s Message means for me. Thank you, Gurumayi, for your teachings and your guidance in putting the teachings into practice. This year mantra japa has become a great friend and teacher for me. I turn to japa more and more to calm my mind and bring peace to my heart. Recently, as I combine the mantra with my breath during japa, the repetitions have begun to enter and vibrate in my heart, and they almost seem to have their own subtle perfume. As I've dived more and more deeply into this practice, it has helped me to make Gurumayi’s Message my own. Now I focus on the words of the Message as I breathe in and out. Repeating it this way is allowing the Message to take root more deeply inside me. I'm so grateful to Gurumayi for these gifts. Whenever I witness something beautiful, I silently recite Gurumayi’s Message for 2017, and savor the sound and meaning of each word. Then, I repeat the mantra Om Namah Shivaya in harmony with my breath. I feel my repetition naturally incorporating the rasa of Gurumayi’s Message. My breath and mind become tranquil, and I experience contentment. I like to combine Gurumayi’s Message for 2017 with my breathing as I do qigong, a meditative form of exercise. As I raise and lower my hands, I bathe in the Message. As I do this, I experience the qualities of love, light, and compassion. I take these qualities as my top priority in my day-to-day life. Every Sunday evening at sunset I go out on my balcony and practice Gurumayi’s Message. I repeat each phrase separately for a while, then repeat them all together. Each time I do it, I feel a deep clarity, contentment, and stillness, and I am filled with energy. I have also been practicing the Message when I am working as a caregiver for elders. I repeat the Message with my breath, and I find I am able to settle into the moment and give my best. Today, I realized that, for me, the first line of Gurumayi’s Message reminds me to be present to the world around me, especially the beauty. As I had this thought, synchronously a dove began cooing outside my window—a sound that I love dearly. Every morning after meditation I set an intention for the day, and then I make a prayer, asking for grace to help me put Gurumayi's Message into practice for the day. The act of making this prayer helps me to remember to put forth the necessary effort to practice Gurumayi’s Message several times throughout the day. One way I make the effort to put Gurumayi's Message into practice is by offering the mantra to the breath. In May, soon after participating in the Global Siddha Yoga Audio Satsang in celebration of Baba's Birthday, I started hearing very beautiful chanting of Om Namah Shivaya within myself. I remember the words of Gurumayi’s Message at the beginning and end of each day. Throughout the day, I‘ve been bringing my awareness to my breath, and I’ve been focusing more on the Heart. During my daily activities, I make the effort to stay centered in the Heart, and to accomplish my tasks from the Heart. Consequently, my everyday life and my practices have been infused with sweetness, ease, and strength. Practicing Gurumayi’s Message has helped me to experience the beauty inherent in my surroundings, with the awareness that Consciousness dwells in everything. Thank you, Gurumayi, for your support and your grace. I repeat the Message upon waking to remind myself to stay with the breath throughout the day. I repeat the Message during my hour's drive to work, which keeps me connected to my heart. During difficult times, I repeat the Message and breathe easy; this helps me to be detached and maintain my inner state. I repeat the Message as I enter meditation, which quiets my mind. I read Gurumayi's talk, "The Benevolent Companion," frequently and try to imbibe the teachings in this talk. When I see beautiful scenes in nature that touch my heart, I repeat the Message to remind myself that the same beauty lies within me. In all these ways, I have found that being with my own breath is the most beautiful thing. With the mantra and my breath, I can enter my heart and become immersed in the glory and greatness of the Self. Thank you, Gurumayi, for your Message and teachings. This summer, I made Gurumayi’s Message my own—by swimming with it. I love to swim. In other exercise activities, I tend to push myself, but when I swim, I naturally relax. I focus on my breath and watch it become deeper, easeful, graceful. And this summer, I've practiced combining the Message with my breath. A response came immediately: “It’s compassion!” As I was flooded with tears of recognition, I watched tension and self-criticism that I hadn’t known I’d been carrying dissolve in the welcoming, accepting embrace of my own heart. I understood that Gurumayi’s Message held further depths for me to plumb—and I also knew that it was now my own. Looking at Gurumayi’s Message Artwork, I understood that the light of the Self is present in everything. This understanding deepened my meditation. Just saying silently as I sat to meditate, “Everything is the light of the Self,” made me slip into meditation in seconds. It also helped me in my daily life. Recently, I was with two friends who were arguing. Remembering that this situation was also the light of the Self helped me stay light and relatively unaffected by the strong emotions between friends. This understanding was one of the most transformative insights I have received from my study and practice of Gurumayi’s Message for 2017.